I'm doing some data collection from a mass flow meter, saving values to a data table which I grab from the PLC using DataXport. The values I'm saving to the data table are floating numbers (MF's), and when I look at the data table the values look fine. 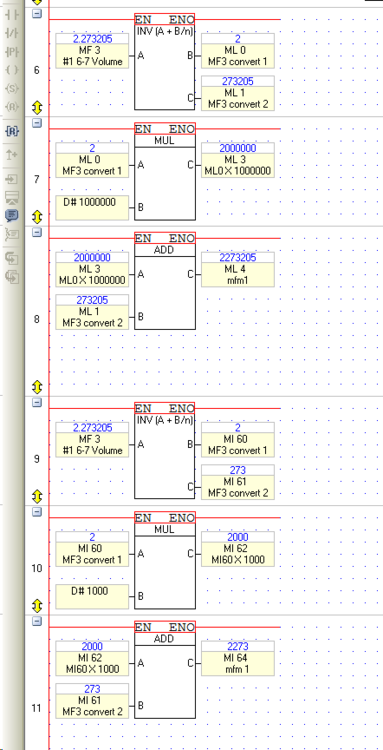 I can do a conversion in my logic from the MF to an ML or an MI, and the guy will have to be happy with an implied decimal point to either 6 places or 3 places. But I'm wondering if anyone knows the reason for the float to text phenomenon, or how to change the way the excel file saves it? I do not know if this will help, but in some programs it is a warning that when exporting to the exel, you must remember the country in which you are. In that case, excel use system separaror that is a coma or dot. 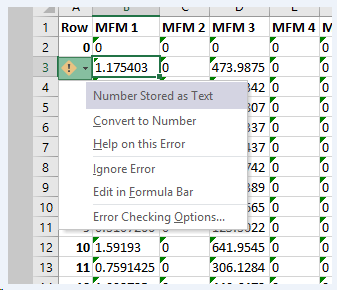 It is selected in excel parameter. Please uncheck "use system separator" and use dot as excel internal separator. Then try to reopen your file. Curious. I'd be having a play with some of the Excel Options, particularly under Formulas and Error checking rules. There are a number of possible suspects there which might be worth a try. Particularly "Numbers formatted as text.......". I'd be having a look at your raw output using something other than excel initially, on the chance excel is indeed changing things to suit what it sees as an error. The other thing to have a look at might be to try things as a csv, and see if things improve by changing the separator in Dataexport properties.